Sterling silver and blackened sterling silver Spine earrings, $395-$420. The earrings were submitted to be used in the upcoming film "Batman v. Superman: Dawn of Justice" and are also owned by Madonna, Lady Gaga and Venus Williams. 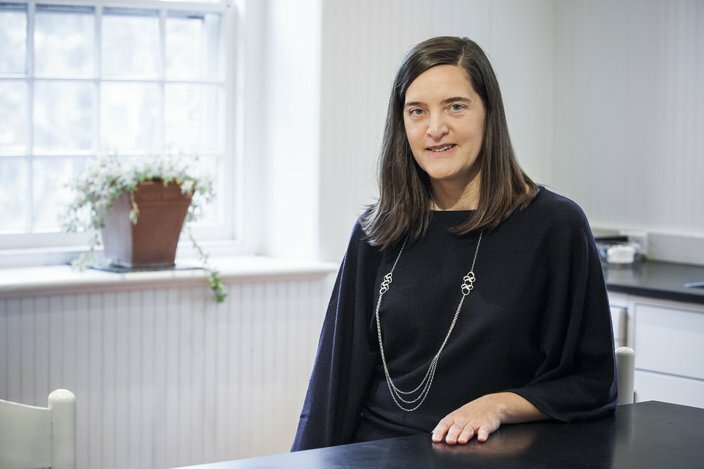 In 2006, Chestnut Hill-based EnA Fine Jewelry owner Karen Moustafellos -- then a creatively frustrated architect -- scratched her design itch by taking on a personal art installation project for her Center City loft. When she received overwhelmingly positive feedback from observers (she decided to put it on exhibit by appointment), she rethought her life's work as an architect. "Maybe industrial design is for me?" she mused. To explore her options, a then-38-year-old Moustafellos partnered with her husband, James, another frustrated architect. He looked to enroll in a metalsmithing course at The University of the Arts but couldn't get a spot. So, he settled for -- what else? -- a jewelry course, a "That'll do" decision that proved serendipitous. Collaboratively, they began using their architectural skills to miniaturize concepts they'd otherwise apply to buildings, ultimately realizing they'd stumbled upon a medium where their talent not only translated, but shined. By the end of 2006, they'd won first place as part of a Fox School of Business business competition, earned in part because of their ability to adapt their skill set. 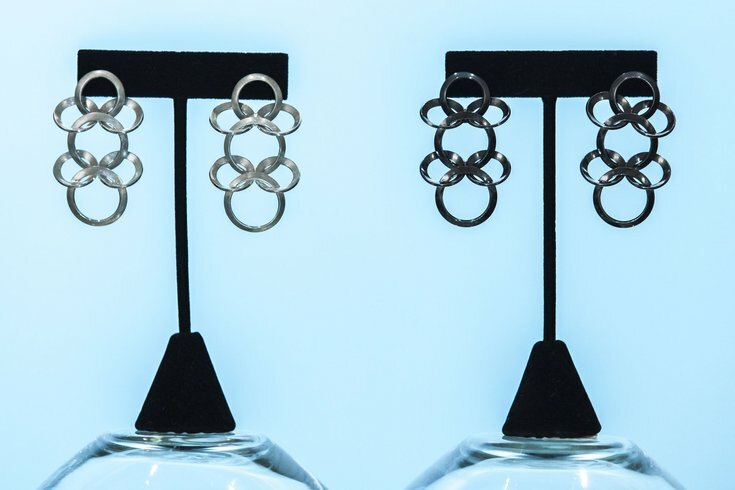 “Architecture is one thing, but jewelry design, installations or any kind of design is just a different scale or different materials," Moustafellos told PhillyVoice, explaining her switch to jewelry design. "Some people say being in jewelry is such a leap [from architecture], but I don’t feel like it is. And that approach shows in EnA's end products. 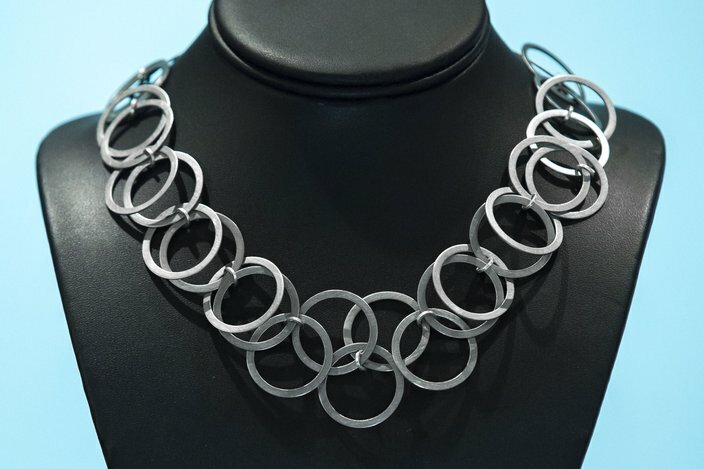 Moustafellos designs jewelry using AutoCAD software for architects, and many of her pieces are precise but bold, sophisticated but edgy. Plus, considering they're crafted with predominantly sterling silver and gold materials, few pieces are particularly flashy. That simplicity, she said, is what attracted the attention of Warner Bros. Pictures earlier this year, when the studio was shopping for jewelry to include in a party scene in the upcoming film "Batman v. Superman: Dawn of Justice." “Someone who knew about us from [our work being featured in] 'White Collar' had put the costume department in touch with us and said, ‘This might be good for what you’re talking about because you’re saying you want something that’s kind of stark and simple, modern and clean,’" she said. "So, they contacted us, had seen the website and really liked the pieces and asked for a selection left up to me. I sent them, and they said they loved the jewelry." She's unsure which pieces were ultimately selected and made it through the editing process, she clarified. But she's also confident it won't be the last film her pieces are featured in. Despite her success on the silver screen, Moustafellos is most proud of the charitable works she's taken on in recent years. “It’s funny. To me, things I feel are real accomplishments for us are the Cover Girl campaign," she said. "Writing a big check to Women’s Way – ‘We did that, that’s really great.’"
For the Cover Girl campaign (no, not that CoverGirl campaign), Moustafellos selects women who wear her jewelry and partners with them to design a piece in support of a nonprofit of their choice. Proceeds from the jewelry sales have benefited nonprofits like the Sandy Rollman Ovarian Cancer Foundation and the Main Line Art Center. All the same, she's flattered to have the exposure and said she'll happily hike to the movie theater to see her creations on the big screen when the film releases this March. In the meantime, she's working on a new collection of jewelry spurred by a recent trip around the globe to places like Japan, Greece and China. It's inspired by both a newfound motivation to incorporate more color in her work (gemstones, for example), as well as an effort to add personality to her pieces. "The thing I realized, is stories are so important -- branding is so important. And, you know, everybody loves to travel, no matter what your socio-economic status is; you do it in a different way," she said. 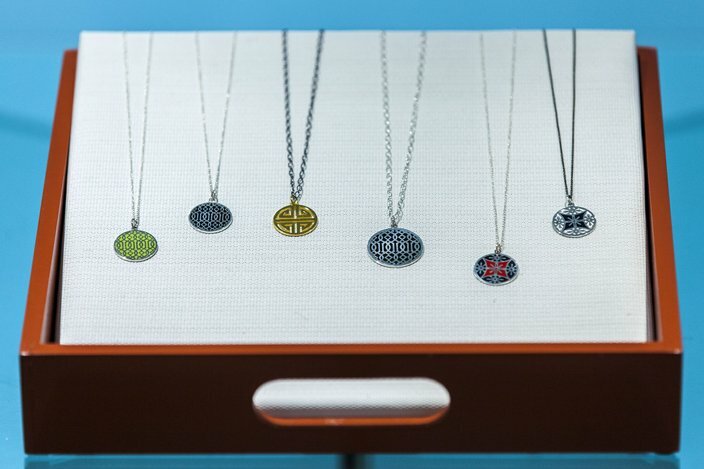 "There are a couple companies out there doing travel jewelry, but the way I envision it is, OK, if you can’t go to Japan but want something that reminds you of Japan without having a stamped thing that says 'Japan,' then people who wear our jewelry who are a little more sophisticated than that may want something that makes them think about Japan that isn’t so literal." To start, she's designed six pendants, each inspired by cities she's traveled to in the past year -- with more designs on the way, as she anticipates another international trip in March. It's also part of an experiment to draw in a younger audience; most of her clients, she said, range in age from their late-30s to 60s. Regardless of age, though, these are women who aren't looking for cookie-cutter jewelry.